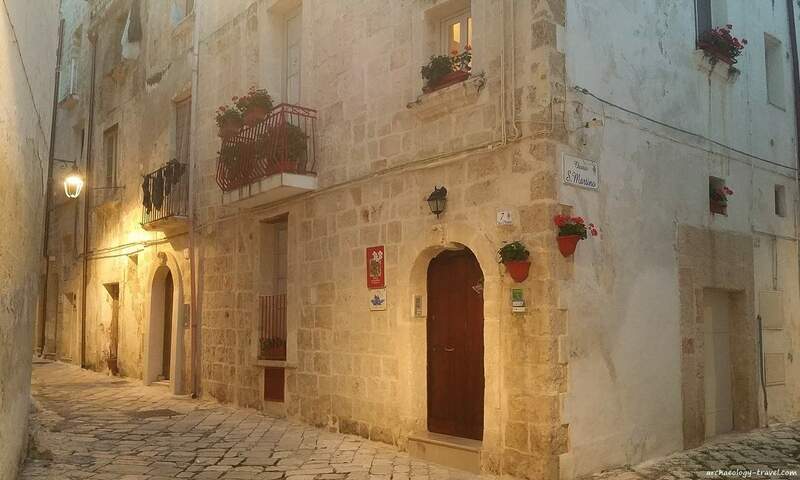 Borgo San Martino B&B is situated in the heart of historic Monopoli, Puglia. Spacious and well equipped rooms offer bed and breakfast and self catering accommodation for couples, families and groups, as well as solo travellers. A few minutes walk to vibrant town squares with restaurants that offer everything from breakfast to a night cap. You are also within walking distance of many interesting Medieval attractions as well as the beach; and only a short taxi ride to some of the regions finest archaeological and historical sites. As I stepped out of Borgo San Martino into the street I was struck by the silence. At six in the morning it was just getting light. Instead of my usual bag check, all I wanted to do was capture the moment. Setting my bags down I disturbed a pigeon; the sound of its wings flapping reverberated through the narrow alleys. I took my photograph of the entrance to this charming B&B in Monopoli and walked to the station. My reason for being in Monopoli was to visit the nearby archaeological site and museum of Egnazia in preparation for my tour of the archaeology and art of Puglia. This was my final stop of a ten day trip. And having explored the labyrinthine Centro Storico of a few Apulian towns, I was keen to find lodgings in Monopoli’s Old Town. 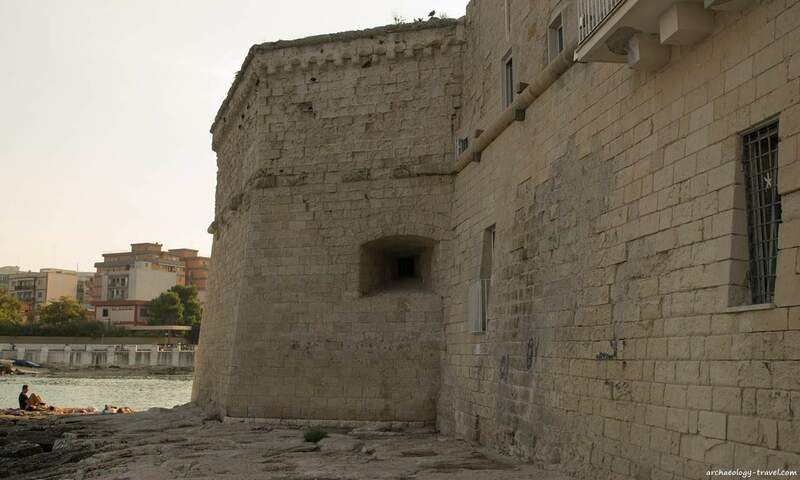 The 16th century Charles V castle overlooking the historical port of Monopoli – still used by smaller fishing boats. And so it was that for my last two nights in Puglia I stayed in the Borgo San Martino. Right in the heart of the Centro Storico. As you can see in my photograph above, the B&B strikes a charming image. Red balcony railings and geraniums at the windows provide a tasteful contrast to the light local limestone. But otherwise the building is typical of the kind you find in the historical quarters of Apulian towns and cities. Wasn’t it Antoine de Saint-Exupéry’s Petit Prince who recognised the significance of geraniums in window boxes? The ‘alley appeal’ conveys what the little Prince would have called “essential information”, that the owners take great pride in their B&B. An impression that is confirmed when you are invited in by sisters Alessandra or Rosanna. For those who do not speak much Italian, don’t worry, Alessandra speaks perfect English having had a long career in hospitality in Monopoli and Milan. Language aside, both could not be more welcoming and accommodating. A staircase with as much character from the architecture as the personal touches takes you up to the rooms on the second and third floors. Climbing the stairs my heart sank: the website promises WiFi. Far too often my experience has been that the further you get away from reception the less likely any such promise will be delivered. A sign of the times perhaps, but the two aspects that are at the top of my list these days are a usable WiFi connection and hot water. Borgo San Martino gets a solid ten for both! Just a part of one of the large, self-catering rooms. Opening the door to my room, the single room as I was travelling alone, I was immediately taken by how spacious it was. There are hoteliers in European cities who would have cheekily squeezed a double bed into that room – and gotten away with it! Besides the single room, there are also equally spacious larger rooms for couples, families or groups of four. 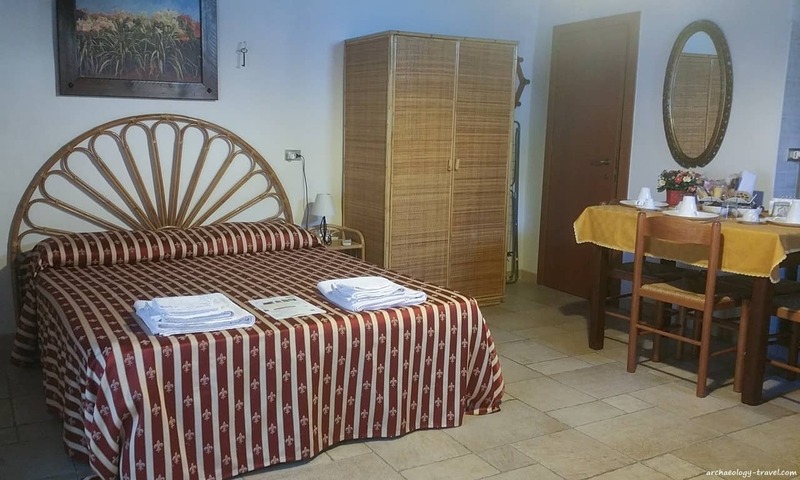 Each room has its own shower and toilet, air conditioning, a fridge, and a helpful pile of leaflets with loads of information about what to see and do in Monopoli and the surrounding area. Good to know: the larger rooms are suited for self catering accommodation. Although eating out in Monopoli is very reasonable. The essentials are provided for a self-service breakfast. For solo travellers staying in the single room, a voucher is supplied to have breakfast in a nearby cafe. Piazza Garibaldi at night, a few minutes walk from Borgo San Martino. Borgo San Martino is just a few minutes walk from Piazza Garibaldi. This is where the solo traveller comes for breakfast. The square has a delightful atmosphere throughout the day, in part because of the mix of formal and informal restaurants, as well as cafes and bars. 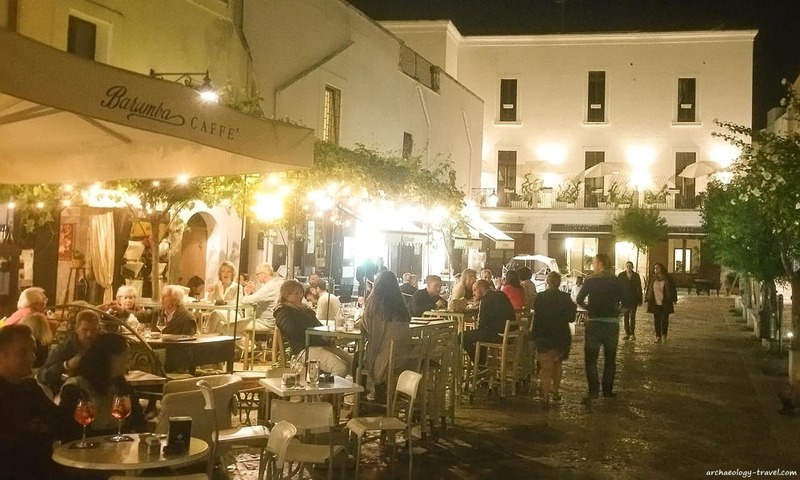 You will also find restaurants scattered around other equally picturesque parts of the Old Town. 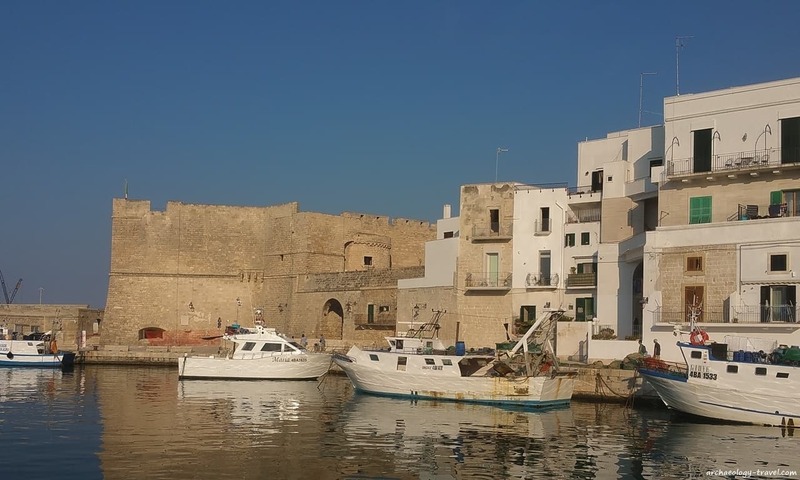 As Monopoli is an active fishing port, you can be assured of a good selection of fresh fish on the menus. Staying in a B&B within Monopoli’s Centro Storico lived up to my expectations, and I did not get lost once. In reflecting on my stay in Borgo San Martino, I am surprised I was struck by the silence of the streets in the morning. Both nights when I awoke during the night I noted the silence. Perhaps sound does not carry through these mazy, sinuous streets. There are many enchanting historical towns in Puglia, and I highly recommend staying in more than one. Monopoli is high on my list of towns to choose as a base for a few days. There is much to see within the town itself: the usual spectacular Baroque architecture, Medieval city walls and castle, an archaeological crypt beneath the Cathedral, as well as a sandy beach. And there are a number of worthwhile attractions, such as the archaeological site of Egnazia, or the UNESCO World Heritage Site of Alberobello, that are an affordable taxi drive away. Catching the last of the sun’s rays on the beach below one of the bastions in the Medieval city walls. If you are looking for B&B or self catering accommodation in Monopoli, I have no hesitation recommending Borgo San Martino. Read about all the services provided (airport transfers, for example) look at the photographs (all representative of the rooms), and book your stay on the website.